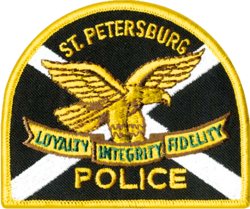 The family and neighbors of Arthur Dixon, 43, has raised questions over his death after two St. Petersburg police officers shot him to death after he brandished scissors in a confrontation. Police were called to the home to deal with Dixon who was threatening suicide and had doused himself with gasoline. Firefighters refused to enter the home and family and friends were cleaning up the gasoline and talking to Dixon when police arrived and ordered them to leave. An hour later, Dixon was dead. Dixon’s mother called police to report her son as suicidal. He had suffered a head injury in a prior accident. The fire fighters were told that he had doused himself with gasoline but refused to enter the home due to a dog in the yard. A neighbor Ray Wuest, went inside and talked to Dixon and took away a cigarette that he was smoking around the gasoline. He went outside to ask the firefighters for material to mop up the gasoline. The firefighters continued to refuse to enter the home and he went back in to clean it up and talk to Dixon. Police then arrived and ordered him out. After police took over, Dixon became irate and ran from the house with a pair of scissors. Two officers said that he raised the scissors and refused to drop them. They then repeatedly shot him in the chest. St. Petersburg police spokesman Mike Puetz insisted “scissors are a deadly weapon. They can cause great harm.” It is not clear however why a taser or pepper spray were not better alternatives. The fact is that the shooting is likely to be found to be justifiable in light of the weapon. Yet, family and neighbors have insisted that they could have talked Dixon down and that the police escalated the situation after their arrival. TYPICAL! Guess they didn’t want the guy to commit suicide so they did it for him. Holding up scissors and refusing to drop them doesn’t seem like a reason to be shot repeatedly in the chest. In the article you quoted, I would wonder how they were being approached by him. If it was a slow walk to try to get them to leave, that would be quite different than if he was running at them with the scissors pointed at them. The neighbor probably was not trained, but at least the guy wasn’t chasing him with a pair of scissors, so he must have been doing okay! Is just a shame that they weren’t able to talk him down or subdue him without having to involve police. Dixon ran out the back of the house where Officers Devin Jones and Curtis Wright were stationed. Dixon held a pair of scissors and raised them in a threatening manner as he approached the officers, Puetz said. The two officers drew their guns and warned him several times to stop, Puetz said, and retreated backward. Still, Dixon kept approaching. I don’t know how you can say that this was not a dangerous situation for the officers. The officers cannot risk having the person come up to them and hork them in the chest with the pair of scissors hoping the person will just give up. People who are emotionally upset enough to risk setting themselves on fire with gasoline cannot be expected to be rational, especially when coming at you with a deadly object. I would not take that chance either. Furthermore, it is not just like in the movies where someone shoots the person in the arm or leg and all is well. What was the backdrop there? Try to hit someone in the upper arm which is very difficult and the round goes in to the back of the house and hits someone there? Much less a moving arm or leg that is swinging as the person is coming at you. Plus, getting hit in the arm is not always going to incapacitate someone bent on doing you harm. I have a friend of mine who had a suspect attack him with a weapon and it took 5 shots from a .40 caliber pistol to the chest before suspect ceased the attack. That is what it took to save his own life. It is not a matter of heroics, trying to play the hero gets officers killed. Letting the neighbor take care of things was the wrong thing to do. The average person is not trained or equipped to handle that situation and what if the police had deferred this to the neighbor and the man flipped out and injured or killed him? What would be said about the police then? The news article stated that this person had a history of assaulting officers, how can you know for sure that this person did not have this in mind. Maybe he did or maybe he did not, but put yourself in the situation where you have to make a stwo second decision with no time for second guessing as to whether or not the person coming at you with an edged weapon who does not repond to your commands and comes at you despite you backing up; are you going to risk your life by taking that risk? That is the situation these officers faced. And I can tell you from experience that this type of situation is one that don’t ever want to face, but this is what can happen to any officer, hero or not. never run with scissors. especially at someone with a gun. The guy probably has a kid or nephew with the same medical condition and a rifle, sitting outside the cophouse as we speak. Ya gotta watch what you do to someone from a deranged family. They might have family. Darren, he was ”brandishing, not charging.” And are you saying that if someone is brandishing (or charging) that you don’t aim for the arm or the leg? You aim for the CHEST??? Multiple times? He didn’t seem to be that out of control with the neighbor, did he! The neighbor took his cigarette away. HE didn’t get charged with scissors. This man had a head injury; he wasn’t a mass murderer. He needed help, not to be murdered. Funny! The firefighters are scared of a dog, that obviously didn’t intimidate the neighbors. The cops were scared of a pair of scissors. The family was afraid he would harm himself. The neighbor was not afraid and acted heroically. But when the cops got there, instead of letting the neighbor continue to try to help, they threw his behind out and acted themselves, and mowed the guy down with multiple gunshot wounds to his chest. This guy was NOT trying to be suicided by cops! The guy had a head injury for crying out loud! Cops who are THAT afraid of their personal safety do not need to be cops. When I was growing up, cops took the job knowing there is risk involved. That’s why cops (and firefighters by the way) retire in 20 years instead of 30, with the state retirement system, because it’s stressful. It is stressful because it can be dangerous at times. But now, there is no more danger for cops, because they just blow everybody away. Not like it was back in the 60s and 70s. The cops had much more respect back then too; they earned it. And the cops that are really good cops and ARE heros don’t get noticed, because there are so many of these goons that get all the attention. There are plenty of totally unarmed people who are blown away too. It is totally out of control, just like everything else in this country right now. I know this looks very upsetting and I would agree that it is but it might be helpful to understand some of the mechanics of these types of calls. I don’t have the official report available to me so I am only commenting based upon the information presented here and the news article that was linked and it might or might not change my observations so I can only comment based upon generalities. As for the fire department, I don’t know how this dog could be so intimidating, but for those who enter burining houses or buildings as part of their job description, that they didn’t go in because of the dog is a little weak. For the police understand that if they are threatened by a person with a pair of scissors, that is just as dangerous to their lives as if the person was armed with a knife. Someone coming at you with a knife is a deadly situation for the officers. The training is that someone threatening you with a knife, that is the police being threatened, the person with the knife is considered dangerous if within 21 feet. If the person having the knife charges you it can take that much distace for you to draw your weapon and defend yourself. If the Taser was available, and I don’t know if it was or not, the training and experience is that you do not use a Taser in a deadly force situation. The reason is that the Taser is a single shot unit (it takes probably thirty seconds to reload a dart cartridge after having been fired) that is not enough time. That is why the training is to use the firearm against edged weapon attacks. It could easily be a situation here where the person was trying to engage in a suicide by cop. I have been in that situation before myself and it is very, very dangerous not only to the other person but the officer(s) as well. You cannot risk your life trying to ascertain exactly if that person wants to “Take one more cop out.” or wants you as the police officer to kill them only. Especially in that the deceased had previously assaulted a LEO and had a robbery conviction. I don’t know if the police officers involved knew this but it could be an aggravating factor in the mind of the deceased. Again, I only have what you do for making a decision. But I would ask that you at least consider the fact that the officers have an expectation of going home safe to their families as well. Some may describe this as Suicide by Police intervention. Likely to avoid “missed tries” by cut wrists or overdose of meds. It shows how dangerous it can be to own a dog. I wonder how many of the cops fired their guns, and how many shots they fired? Reading about various incidents, I sometimes get the feeling that they shoot ‘in the hope of hitting something’ – rather than ‘to kill’. I think, for example, of those two NYPD cops who fired 17 shots at a guy standing in front of them and injured 9 bystanders. Florida. Again. What’s WITH you people?